Forty prison inmates were sent to hospitals, four of them airlifted, after a riot erupted at the California Institution for Men in Chino, a spokesman said. The melee broke out at about 8:30 p.m. Saturday at the Reception Center West facility, said Lt. Mark Hargrove, prison spokesman. The situation was under control as of Sunday morning, he said, and inmates who had not been admitted to hospitals were being returned to the prison. The scene of the violence was a medium-security housing facility with seven units, each unit housing about 200 inmates, he said. Some 80 officers responded to the riot, during which a housing unit was set on fire. As of Sunday morning, authorities did not know how the fire started. The inmates’ injuries ranged from stab wounds and slashes to head trauma, Hargrove said. Some injuries were considered life-threatening. No prison staff members were injured. Hargrove said the inmates used “weapons of opportunity” such as broken glass during the riot. Images taken from the scene showed flames coming from the building as a helicopter hovered overhead. 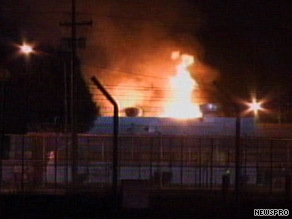 A similar riot broke out in December 2006, Hargrove said. Chino is about 35 miles east of Los Angeles.